My current evolutionary process is surprising me. I had two major perceptual changes occur in my thinking yesterday. The first had to do with my long held pacifist based belief that if we just stayed out of war and conflict all over the globe the world would be a better place. Then yesterday I saw part of a documentary on the formation of ISIS. I began to see that there is no real isolationism in reality. Countries are like objects hung on a mobile—–when one country is shaken the rest of the countries move too. In other words, much as I hate to admit it, Systems Theory applies to our world; what affects one country affects other countries whether that country is actively involved in the “fighting” or not. For a long time I have believed we are “all one”—-all connected as brothers and sisters in God’s creation. What I tend to deny is that connection includes being connected with all aspects of each other—even the evil aspects. I can focus my attention and intention on “the good” or “the evil.” Most of what has been grabbing my attention lately is “the evil.” That reaction is fed by fear and unmet expectations. In response I can have a childish temper tantrum or I can re-focus my attention and intention on supporting “the good” that is in creation. In my better moments I choose the latter. And, yes, my individual attempt at living the Golden Rule is not as big or as powerful as ISIS. But, if each of us makes a “positive ripple” in our reality, the transformation in our reality will be epic. The other perceptual change occurred when I watched last night’s 60 Minutes’ interview of our president elect. For the first time, I listened to this man speak in a normal tone of voice saying some things with which I found myself agreeing. The perception I previously held of this man as a narcissistic bully was suddenly replaced by the perception of him as a human being faced with the challenge of running out country and willing to begin doing so with the intention of serving the needs of the American people rather than just his own. I even started to feel a glimmer of hope and to question whether his behavior prior to this was a “reality TV part” he played encouraged by media coverage and intended to manipulate the American public into voting for him. I still don’t trust the man, and I don’t know if I ever will or should. However, I must allow myself to see this man more objectively than I have in the past. I am hoping the media, and myself, will stop “fanning the fire of negativity” and start considering glimpses of positive, reasonable, and yes, caring aspects of this human being as something upon which we can focus our attention from time to time. Enough said. I need to keep my heart and mind open and continue to use love as my compass as I follow this evolutionary path called life. It has been many moons since I have written something for this blog. I am at the point where I must write if I am going to survive. The past year has been brutal. The discord and just plain ugliness that led up to the election last week has been worse than I remember ever experiencing before. Like others, since Tuesday night, I have been in what we used to call “a funk.” I currently define that as something just short of depression—–something that is almost paralyzing that makes it hard to do anything. I’ve stopped caring about doing what I know keeps me healthy. I’ve had trouble sleeping. I am forgetting to take my medication as prescribed. I am forgetting to eat, and when I do remember to eat I do not make the healthiest eating choices. I’ve wanted to do something, and have—– but nothing has seemed to free me from this morass. I’ve crocheted, I’ve read, I’ve walked, I’ve made earrings and necklaces, I have shared concerns and feelings with my friends, and I have prayed and prayed. I have kept putting one foot in front of the other, as we say. I know I am part of the problem that shaped this political fiasco. I know I must be part of the solution. Therefore, I have prayed about how to be part of the solution. I have been asking the God of my understanding what I need to be doing. I do not get loud and clear answers in response to my petitions. Instead, I get reminded that my role is, as always, to love because the rest is up to God. But how am I to love in times like these? How do I love my neighbor when my very being, my beliefs, and my values have been trampled? One answer I keep getting is almost too simple. It is as if God is saying, “Just do it.” I know the commandment is to love one another. Period. No exceptions. So I’m getting a strong direction, not to over-analyze or paralyze myself by indulging in fear and worry. It has been hammered into me for decades to pick up the pieces and just live one day at a time. There have been no promises that all those days would be easy. I do know that if I don’t want to be part of the problem I have to be part of the solution. So I am going to “keep on keeping on” and trusting God who keeps saying, “Don’t worry. I’ve got this.” I am not going to invest my energy in “what ifs”——instead, I am going to invest it in what is. And the truth is my thoughts and actions help shape my reality, and it is about time I broke out of my “funk” to start consciously participating in the solution. Finally, last night something came through on Facebook that gave me something concrete I can do to start living in the solution. People have started wearing safety pins as a symbol of support for persons of color, women, LGBTQs, Muslims, Latinos, and anyone else that has been targeted with political bullying these past few months. Wearing this simple symbol lets those people know I am safe to talk to and that they can put their guard down when they are around me. And, since I am a woman, it is also a symbol that I value myself and others symbolically devalued in the election; it is a symbol that I will take a stand to protect our rights. This morning at Centering Prayer I was reminded of the importance of being tethered to the God of our understanding by our longing to be connected to the love of our Creator. In other words, our willingness to surrender ourselves to attain a connection with the total love that created us and is part of us is crucial in this journey we call life. If we are not willing to surrender our “I-ness,” our ego, if you will, then our own self-will creates a barrier between us and our Higher Power. What immediately came to my mind was the realization that my surrender of wanting to be in control and to be independent (my “I-ness”) is not a one time, all or nothing occurrence. 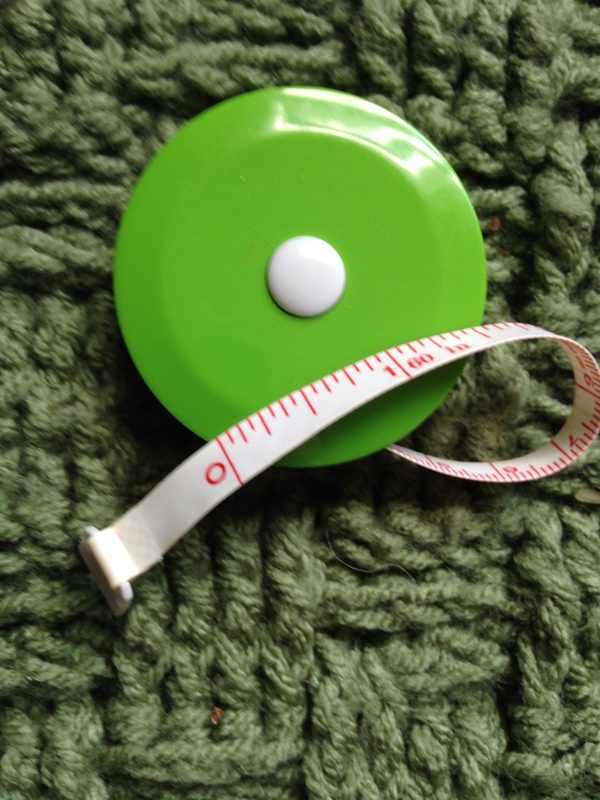 My surrender of self will is like one of those small round tape measures that let you pull out the tape measure to any length you want and then, at the push of a button, the tape measure is immediately retracted. When I surrender self and connect with God’s love I will eventually allow someone or something to push my “ego-button” so that my connection with God is severed and I retract back into my ego-driven isolation. I have worked so hard and so long at not being dependent or co-dependent on any person, place, or thing that it is difficult for me to realize the God of my choosing cannot be limited to or defined by one of those categories. To not accept my total dependence on God for every breath I take is sheer insanity, but my ego keeps desperately hanging on to that denial. My ego has been having a denial party ever since my best friend died this summer. I found myself submerged in grief, despair, anger, and the feeling that no matter what I did, I was going to die anyway, so I might as well live for the moment and stop denying myself what gives me pleasure. Fortunately, for me, that did not send me back into practicing my addiction to alcohol. However, I did start eating what I wanted to when I wanted to. Was I suicidal? No, being a diabetic, I still did not eat sugar, flour, bread, or high glycemic fruits and vegetables. But I did over indulge in protein, milk products, fats, and nuts. Guess what happened? The usual——I gained some weight, food stopped tasting good, and nothing was filling my “emptiness.” It wasn’t until I stopped the denial/self-pity party and started weighing and measuring my foods again, saying please and thank you to God every day, and taking baby steps towards regular exercising that food started tasting good again and I started feeling “okay” again. Of course, my body rebelled and let me know it did not like “detox”—–but, being the “surrender, take it back, surrender again” type person I am, I was used to that and it didn’t really bother me. I think I did so just in time because last night I had another medical crisis that kept me awake for several hours and convinced me once again that God is in control when all else fails. I experienced symptoms for several hours that usually either put me in the ER or in the hospital for a week or so or both, and I knew I had to surrender and trust God. I was able to stop fighting the pain, to accept it, to take my prescribed medicine, and to turn myself, my will, and my pain over to God with the understanding that I might still need to go to the ER if the medication did not work. God and the medicine worked their magic—–I was able to sleep for a few hours, and when I awoke the pain and nausea were gone. The relief is indescribable, and I am most grateful for God’s gift of another day of life. God bless and keep you. Melt Vaseline in jar for 1 minute in Microwave on high. 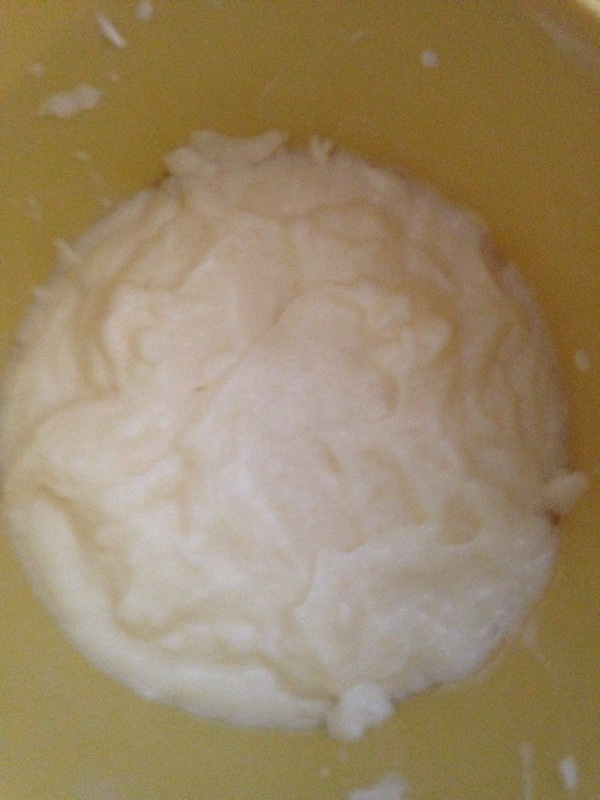 Move Vaseline into large mixing bowl & put in Microwave for 1 more minute on high. Stir Vaseline and add other two ingredients. Stir vigorously until all ingredients are thoroughly mixed (make sure there are NO Vaseline lumps). 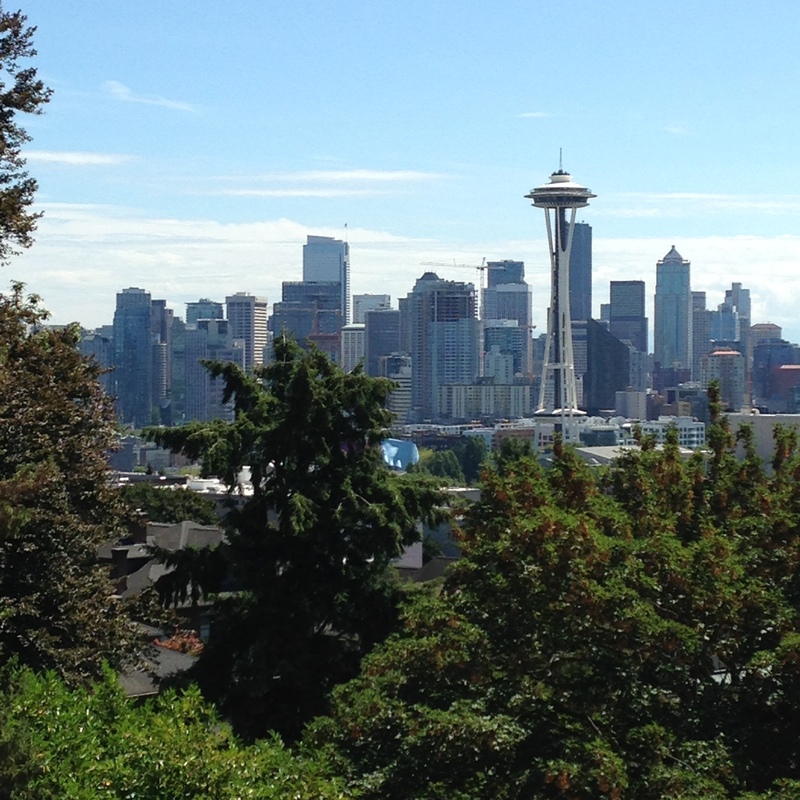 Well, I just spent about two weeks visiting in Puyallup, WA. Everyone thought I’d be enjoying rain every day, but it only rained (for longer than thirty minutes) one day while I was there. In fact, they are experiencing a terrible drought that may eventually kill there beautiful evergreens in the next couple of years. Now that I am home, according to the news, their forest fires are also spreading across the state from east to west, so fire may eventually be a threat to the Puyallup area also. I did, however, enjoy the cooler temperatures and lower humidity levels—-and, of course, the spectacular views. I enjoyed spending time with my sister. 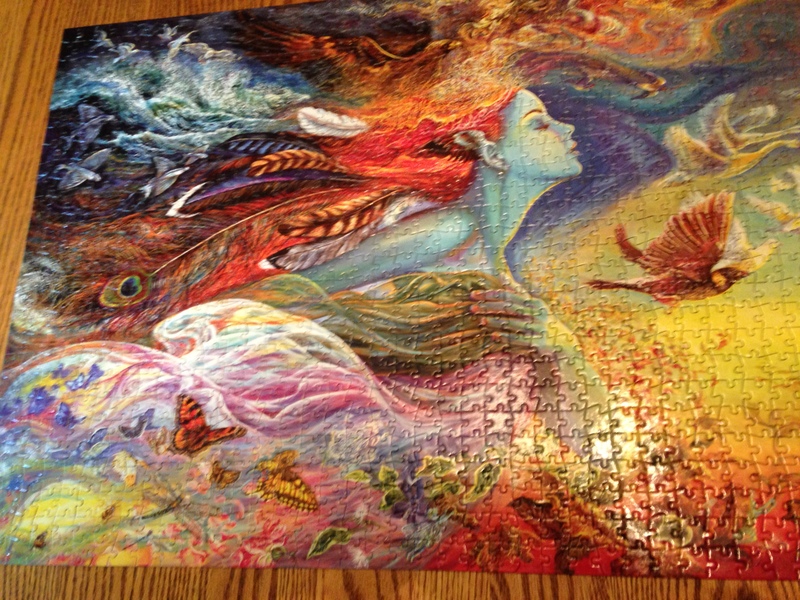 We let ourselves indulge in adult play (creativity) beading bracelets and finishing a very challenging but beautiful jigsaw puzzle. In order to enjoy this vacation I had to work up my courage to face the challenge of flying in today’s world of post 9/11 aviation. I did not have any trouble in St. Louis; TSA did not have me take my shoes off, “x-ray” me in any “hands-above-your-head” machine, or pat me down. The guy behind me had to have his hands checked for powder residue, so I can only assume they were doing a bit of profiling—-all he did was lean against the metal railing while I was walking through the “entry scan gate.” Of course, every seat was filled on my flight, and the hardest thing to tolerate, for me, was what sounded like three babies not just crying but shrieking at a level very painful to the human ear. The best part of my flight from St. Louis to Sea-Tac was conversing with my “seat mate.” He was a young man from China who had been touring the U.S. He talked about his travels in Europe and Russia, and he said he liked America the best. When I asked him what it was he liked the best, he said “the freedom.” His reply almost left me speechless because I realized I tend to take that aspect of our country fore granted. I realized I have spent my life here actively protesting (in my younger days) and intermittently complaining about what I consider negative aspects of our country’s political realities rather than being grateful for the positive aspects of our democracy. That one comment provided the most potent “aha” learning moment of my vacation adventure. My flight back was not filled with shrieking babies, and I got to change planes—–to a seat that had an empty seat between me and the other man in my row of seats. However, my PTSD symptom remnants made waiting to get on my plane at SeaTac very uncomfortable. TSA there was doing a fantastic job of protecting all of us, and I got to experience security measures I have never experienced before (like a sniffing drug dog, the infamous “x-ray” machine, and being patted down and having my hands checked for powder. No profiling here— I was glad to see sweet little old ladies had to take their shoes off and be treated like everyone else….very carefully. Once I got to my gate, I knew why. I was in a major port of entry/departure, and the entire hub of gates where I had to wait was standing room only. When I finally got a seat after about 45 minutes, a young man set down next to me. He started playing a car racing game on his tablet——-and he actively took those turns by shifting his body weight and moving his arms at different angles—— an action that resulted in me being repeatedly touched/jabbed with his elbow. I finally got up enough nerve to ask him to please play another game that didn’t necessitate him repeatedly jabbing his elbow into me. He was more careful after that. I was extremely happy to walk in my own front door about 2 AM. I was “too tired” to get to sleep until about 4 AM, and my dogs woke me up at 6:30 AM; this made for a very surreal Sunday. All in all, I learned that even though travel has its challenges, the rewards still outweigh them. In retrospect, I can clearly appreciate that now, but when I was being repeatedly “elbow jammed” I had my doubts. Enough of my travel log. God bless and keep you. It is 2:10 PM in the afternoon with a heat index of 108. At approximately 2:00 PM I heard a sound I have never heard in this neighborhood before. It bothered me, and it bothered my dogs. It sounded like the “Hound of Baskerville” baying —you know, the one in that old Sherlock Holmes black and white movie. I opened the blinds to try to locate the source of the racket; no dog could be seen. Then I looked at my watch. My best friend’s funeral had just started at 2:00 PM. The noise stopped, but I feel like howling and baying too. Because of my health, my age, the heat, and the long distance involved, I decided not to drive to my friend’s funeral. I am there in spirit as I type. In a way, I am relieved not to be attending because it will make it easier to remember my friend alive, vibrant, and full of spiritual energy. I do not think the howling, baying dog was a coincidence. My friend spent many years working with rescue dogs and in shelters. I am sure her pets which were put in a no-kill shelter miss her as much as I do, if not more. She was the “go to person” in my life whenever I had a medical question or a dog question…..and she was the one I could and did talk to about any and everything at least several times a week. For instance, last night I made a memorial donation to Wounded Warriors in her honor (she was a Navy nurse), and the form I was filling out asked for a family member’s address. I was stuck—–my friend was always the one I called for information about addresses and birthdays. I was involved in a long theological discussion at a bible study group last Sunday, We discussed the meaning of resurrection, the importance of one’s body, and the role one’s spirit plays at and after the time of death, etc. I shared I did not believe one’s soul, spirit, or body can be divided into separate entities—-that we are holistic beings created by God in this life and will still be following our death. I probably didn’t say it quite that clearly, but I think my friends in the discussion understood what I was trying to say. My friend is still my friend whether she is in this world or the next, this universe or a parallel universe, or is in the exact shape she had on this earth or one a bit different once her transition is finished. The difference is, however, I cannot see her, have a conversation with her (at least one in which she answers me), touch her, or enjoy her company as I once did. That hasn’t stopped me from talking to her a lot, and at times I can almost hear/feel her answer. I am writing this for myself as well as to and for my friend. Maybe I just want to get my mind off the funeral, but I think what I really want this writing to accomplish is to make some sort of order out of my jumbled thoughts and bruised emotions…..to let my friend know somehow how much I still love her and always will. 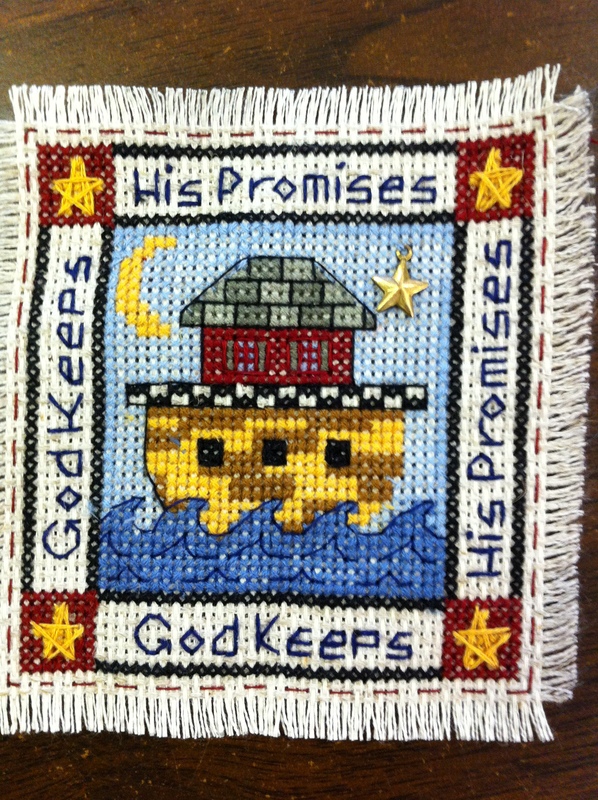 Today’s photo is a reminder of how much she loved Noah’s Ark and rainbows and God’s promises. As always, I will close with God bless and keep you…..and with a big thank you to God for keeping and blessing me at this time when I feel like I need it most.